No, seriously, we are gonna get this done. The text translation, as many have pointed out including myself, is at 100%. All that’s left, as I’ve said before, is images, hacking and testing. I realize this has taken a long time- and for that I apologize. I do still take the stance that this is being done for free, and that I technically don’t owe anyone anything, but I do feel bad about how long this has taken. Even if I ignore that everyone that has been following this project deserves the patch, it needs to be done because the text translation has been completed. To just sit around and not finish this, when others have finished their part, is poor form. I realize this and we are going to get this done. Note that while you flip through those, some will seem off center from each other. That’s not my fault- the originals were like that so I lined up my text to match those. These images have not all been tested in game completely (though two of them were found to be too large and had to be redone), but they were pretty straightforward and should work with little issue. Also ignore any ugly white borders or anything, the actual images aren’t like that- not sure what is causing that in the slideshow. As for hacking. I talked with Soywiz and he wants to get this done as well, he holds the same opinion as me. The plan is that we’re (he is, I dunno how much I will be able to help) going to tackle the hacking soon. When I talked to him he was busy, but assured me he would have free time in the future, and wants to get this done. As for how it will be done (this has been a major thing brought up in previous posts) we might take the hacky approach at first to get something done (the text splitting) and later release a nice solution. Or, we will do the hacky approach and release everything we have encase someone else wants to attempt a nicer solution. What is going to happen hasn’t exactly been decided yet and isn’t set in stone- but we will tackle that when the time comes. Then finally, testing. People involved in the project want to test the patch before publicly releasing it. I don’t expect it to take too terribly long to test it and I will let you know when we get there and will keep you updated with hacking along the way. Once things get into motion with the hacking (unless it finishes quickly or I am very busy at the time (which might be possible)) there should be plenty of bits of information to pass on when that time comes. Thanks for sticking with us through all this. As most of you have guessed, this was in fact an April Fools joke, there is no Game Boy port and there was no robbery. We’ve been playing with the percentage on the image ourselves– we will update the percentage counter here soon to show the correct amount. All of us are really discouraged by these recent events and the idea of having to start the translation again from scratch, but there is some more good news. Soywiz had been experimenting with porting SHNY to the original Game Boy. He actually made a lot of progress, and the files for this project were contained on a different computer from the one stolen. 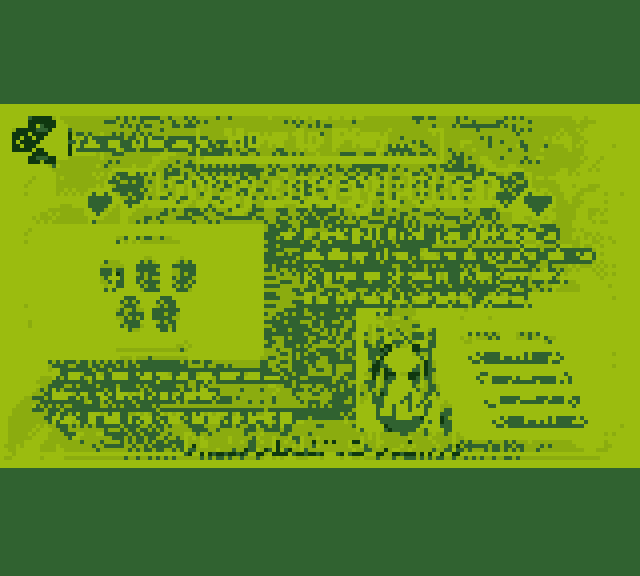 So while we cannot deliver the PSP translation to you guys, we can show off the Game Boy port that is going to become the effort for the people assigned to hacking. The Game Boy port doesn’t have any of the translated text because Soywiz was only focusing on porting the engine to start. I have some screenshots I can show off to you guys so you can get an idea of what the game will look like (note: these images are scaled up by a factor of 4). 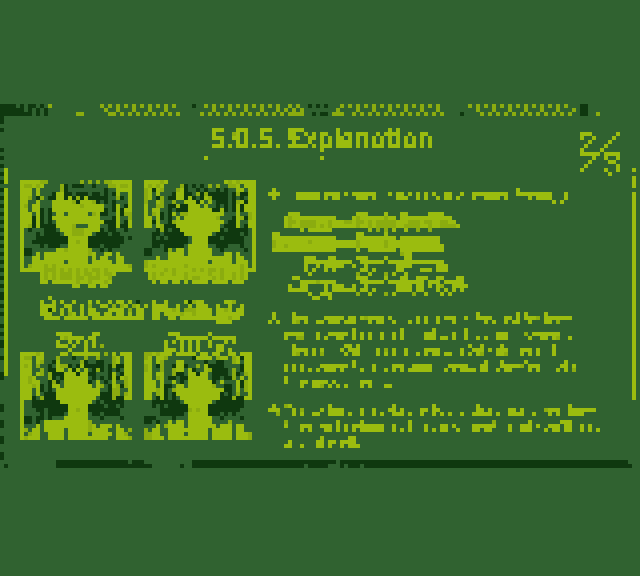 You will notice the the images are translated, this is because I had a back-up of the images on my computer, and tested them in the game to see how easy it would be to use what we do have left to translate this version. Because we have lost all our work on the PSP version (hacks and text translations) and because the PSP can emulate Game Boy games, we may just shift our focus to this port and re-translating for the Game Boy version. By focusing on the Game Boy version, we can introduce the game both to PSP users who can emulate the Game Boy, as well as all of the Game Boy users across the world. I apologize about what has occurred the past couple days and what it means for the translation. Everyone involved was really excited to be able to release a patch to allow you all to enjoy SHNY on your PSPs. It saddens us that we will no longer be able to do that for another couple years. I really appreciate all your support since the start of this project, and we promise to bring you an even better version of the translation in the future. Told you I would write a new post since I was going on vacation- and seeing as how my flight has just been bumped to a 5 hour delay (versus a 2 hour delay, I wasn’t even suppose to transfer planes), now seems like a good time to do this (ignoring that I don’t have internet to post it atm). (Actually, I’m actualy posting this during the flight home- I’m on the plane atm). So, what has been going on? What is there to say? We surpassed the 50% mark a while ago- most of you noticed that. I was originally going to make a post after that happened, had it written up and everything, but I never got around to adding the pictures I had planned for it and it never got posted. So, months later, here’s a blog post mentioning it. At this point, the scripts are all translated, all that is left are the motion portrait scenes. But, as I’ve said before, when that hits 100% it doesn’t mean that a patch will instantly be released, but it will be close. Proof reading and testing will still need to be done, but the hardest part will be out of the way. Which brings me to my next point. Hacking. There are a couple things that need to be done in terms of hacking- somewhat important things. Extending the display buffer for the text, as well as the backlog and names buffers. Right now there are names that are too long (they could be shortened if need be) and when they are displayed it also displays the script name since it overflows. As for the text buffers, if we overflow those we get a crash. Right now Soywiz has put a fix in place that splits text entries that are too long into two separate entries, but this isn’t ideal. If we can’t really extend the text buffer, we can improve the way splits are done (it’s pretty messy atm) and use that. As I said before, I started working on the hacking aspects during a short span of time off I had, but most of my time was spent getting the emulator to break on memory writes like it should. I have three addresses in the boot.bin that contains the code that writes to the buffer, but since the emulator doesn’t do tracing, things are turning into a bit of a larger pain than I initially expected- and then I just ran out of time to work on it more. And, while I’m on the subject of emulators, good news for those who can’t run ISOs on their PSP (since you have to run a patched image, not because you have to pirate it), JCPSP can run SHNY- you just a) can’t use the media engine (it hangs when starting a game if you do, and the PMFs don’t have audio anyways, iirc some of SHNY’s PMFs are a screwy format). And b) You need fonts off a PSP and need to have the emulator use those fonts, without the PSP fonts you won’t get/will get screwed up text output. But otherwise, the game is playable (albeit slow). Also, this was using a version of JCPSP that is out of date- if you get the most recent builds, the PMFs might work and not hang. Looking through some of the changelogs since the version I was using- at least the hang bug might be fixed, if not the audio as well (Also, the fact that I don’t have sonic stage or whatever program is needed for the PSP audio format installed might be why I don’t have audio). So, to sum things all up- translation is still coming along and getting close. Hacking still needs to be done, but since JCPSP can run SHNY, and has some debug features (tracing would make me a happy camper though) it’s a big help. Things are coming along, still, but as usual most everyone involved with this project is busy. But we are still alive. I might move back to youtube, especially since it’s not as bad quality and length wise as it once was. Though some of the videos that were on my Vimeo are not on my computer, so I’m not sure how much I can get back up- but I will work on it, I think I still have most of the videos I made for this project lying around. I promised it, so now I will follow up- the only problem is (like I’ve said) there isn’t too much to say. Soo, this post, in order to fill it out a bit, there is probably going to be a fair bit of off topic. So let’s start, of course, with the on topic stuff- the translation. The script translation has been chugging along, Tom has been busy lately and his bits of free time have been getting sucked away with other things, but I do believe he will have more time in the future to put towards working on this- but he should correct me if I’m wrong. There are still images to do, but they are all small and there is more than enough time to do them before the script is done. And hacking wise there are still a few weird bugs, but- as with the images, there is still time to work on that later (and I haven’t heard from Soywiz in a while, but this tends to happen, so I’m not worried.) And… I don’t know what else to say here, so this might be all the on topic stuff I can come up with– told ya there wasn’t much to say. But I guess posting like this does indicate that we are still alive and kicking- and I was starting to feel that there hadn’t been a post in a while (I’ve just been extremely busy, got a job recently and between that and school my free time went from plentiful to almost non-existent). So, what else is there to post? I could rant on about life, but that’s not the kinda stuff you are here to read about, so let’s throw in something at least some of you might be interested in. I debated posting this a while back, but since it was off topic and I felt a post dedicated to it was kinda outta line I didn’t. But seeing as how it will fill out this blog post nicely, I might as well. Plus, I’ve previously done Chrono Trigger related stuff on here (April Fools stuff) so why not? The programming aspect too a couple months of work, and the reversing took a couple weeks I believe. I did the reversing a couple months before the programming and had asked Soywiz to program it (because at the time I could program at all). But, he’s got a lot on his plate and is usually busy with other things, so he never got around to it. So, now that I’ve completed the core programming class and know a bit about what I’m doing, I wrote that. You can download it from the thread on RHDN, and it also includes the source for the DLL in the download. The source for the injector isn’t included, but that came from a tutorial which I link to in the credits (with some very minor tweaks so that it uses relative paths). As I say in the RHDN thread, the source is released for purely education purposes, being able to reference code and see how things are done is always a huge help to me, and that’s my thought when including the source with the release. Also, to make this a little special, I’m going to include some things you will only find in this blog post. First, here is a promo video that I was working on to release with it. But for a promo I didn’t want to use commercial tracks (and I accidentally used two) and I didn’t want to change it, so I ended up scrapping the promo video idea in place of a gameplay video. Also, here is my favorite scene in all of Chrono Trigger with my replacement music (again, I didn’t normally release this video or use it in the promo video since I knew it had commerical music). Those links will eventually go down since they are hosted on tinypic, but they should last long enough. The oldest of the two uploads is already from almost two months ago (I dug them outta chat logs). And lastly, for you guys, I’m gonna give you my recommended track list (it actually does take some time to throw together 82 fitting replacement songs), but it will be in the comments, and I’m not giving out a download, since it does contain commercial tracks. I’ve been meaning to make a proper post, but there hasn’t been much to say and I’ve been really busy. I’ll try and whip something up for you guys in the next couple days.